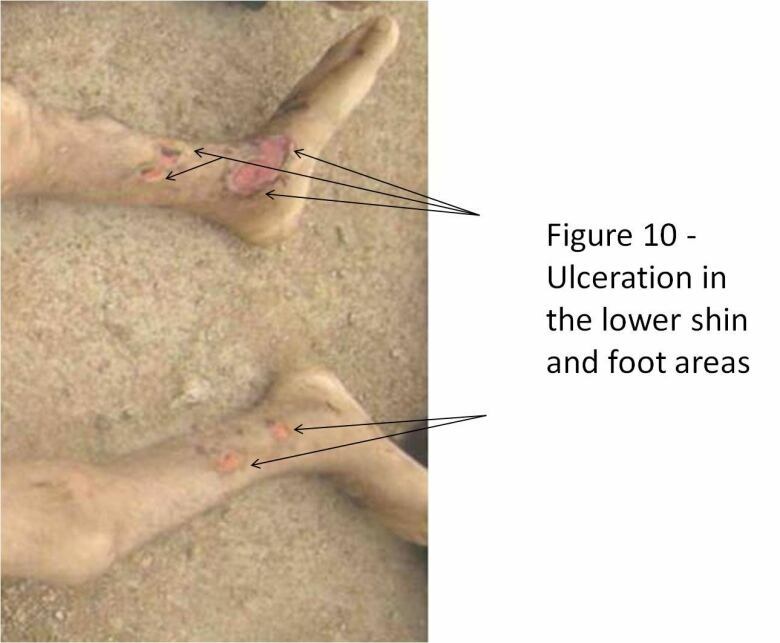 A Syrian military police photographer has supplied "clear evidence" showing the systematic torture and killing of about 11,000 detainees in circumstances that evoked Nazi death camps, former war crimes prosecutors said. Syrian officials could face war crimes charges as a result of the evidence provided by the photographer, who has defected, the three prosecutors said. One of the prosecutors said the evidence documented "industrial scale killing" that was reminiscent of the Second World War concentration camps of Belsen and Auschwitz. The trove of harrowing photographs ratchets up the pressure on Syrian President Bashar al-Assad, who the United States and its Western allies say has committed war crimes against his own people during the civil war. Assad, once courted by Western leaders and now supported by Russia and Iran, has denied war crimes, saying he is fighting "terrorists" who want to use Syria to sow chaos across the Middle East. But 55,000 images provided by the photographer, who fled Syria after passing the pictures to Assad's opponents, show emaciated and mutilated corpses. Bearing signs of torture, some of the corpses had no eyes. Others showed signs of strangulation or electrocution. 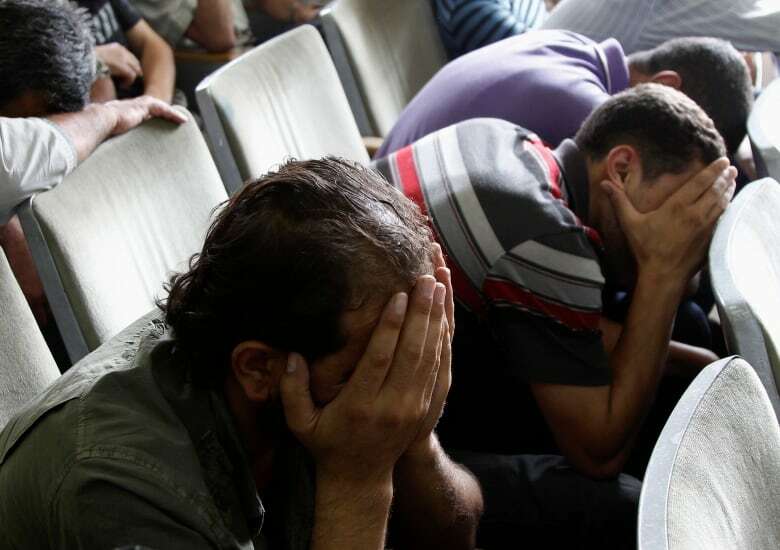 "There is clear evidence, capable of being believed by a tribunal of fact in a court of law, of systematic torture and killing of detained persons by the agents of the Syrian government," the three prosecutors said in the 31-page report. "Such evidence would support findings of crimes against humanity against the current Syrian regime. Such evidence could also support findings of war crimes against the current Syrian regime," they said. The report was published as opposing sides in Syria's civil war gathered for internationally sponsored peace talks in Switzerland. The defector, who was codenamed Caesar and whose identity has not been released to the media, had worked as a criminal investigator for the military police for 13 years prior to his defection. But with the onset of civil war, Caesar became a recorder of death for the Syrian authorities: photographing up to 50 corpses a day in a job he said caused psychological suffering to him and his colleagues. The images he took were passed to the Syrian National Movement, which is supported by the Gulf state of Qatar. Lawyers acting for Qatar, London-based Carter-Ruck and Co., commissioned the examination of the evidence. Reuters has reviewed the report but it was not possible to determine the authenticity of Caesar's photographs or to contact Caesar. It was not possible to get an immediate response from the Syrian government. The three former prosecutors, who worked at the criminal war crimes tribunals for the former Yugoslavia and Sierra Leone, examined the evidence and interviewed the source in three sessions in the last 10 days. They found him credible. Investigators also conducted forensic testing on some of the photographs to determine their authenticity, according to Prof. David Crane, one of the report's authors. "These photographs are so detailed, so authentic that it would be harder to fake them than to actually do them," Crane told CBC News in an interview Tuesday. "The inquiry team found that the witness codenamed 'Caesar' was not only credible but that his account was most compelling," said the document, entitled A report into the credibility of certain evidence with regard to torture and execution of persons incarcerated by the current Syrian regime. The authors are Sir Desmond de Silva, former chief prosecutor of the special court for Sierra Leone, Sir Geoffrey Nice, the former lead prosecutor of former Yugoslav president Slobodan Milosevic, and Crane, who indicted President Charles Taylor of Liberia at the Sierra Leone court. 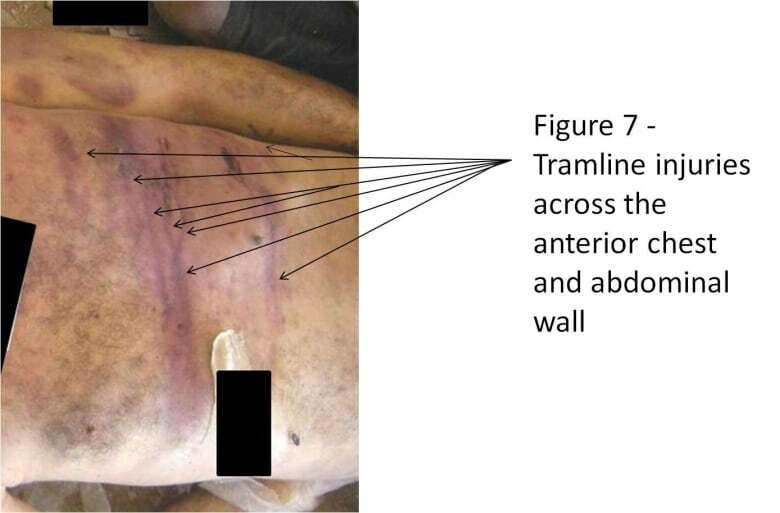 Tramline bruises are produced by blows with rod-like objects, the report explains. (Carter-Ruck and Co.)"Some of the images we saw were absolutely reminiscent of pictures of people who came out of Belsen and Auschwitz," said de Silva, one of Britain's top lawyers. "It is the tip of the iceberg because this is 11,000 in just one area." "This is not to say that the people on the other side have been free of serious crime. I think there is evidence that has led very responsible people to say there have been crimes committed on both sides," he said. "But this industrial killing of people in detention in our view is clearly that of the government." Pictures in the report showed emaciated bodies of young males, some with ligature marks across the neck or tramline injuries indicating blows with rod-like objects. Caesar told the inquiry team his job was to take pictures of killed detainees though he did not claim to have witnessed executions or torture. "There could be as many as 50 bodies a day to photograph which required 15 to 30 minutes of work per corpse," the report said. The photographs allowed a death certificate to be produced without requiring families to view bodies, and also confirmed that execution orders had been carried out, the report said. Families of the dead were told that the cause of death was either a "heart attack" or "breathing problems", it added. "Overall there was evidence that a significant number of the deceased were emaciated and a significant minority had been bound and/or beaten with rod-like objects," the report says.